Need a new pre-treatment system? 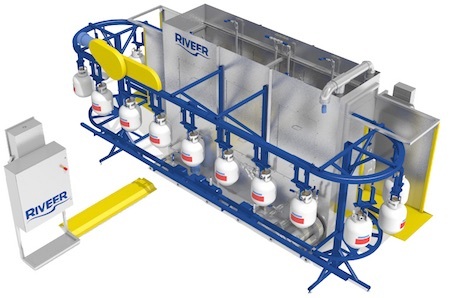 Riveer’s experience with pre-treatment systems—from metal cleaning, solution choice to solvent recovery —can help you reduce costs and ensure that you will more effectively achieve your goals. Designed and fabricated a building with 14 computer-controlled monitors to automatically wash construction equipment. Includes 3,000 GPM hot water flow to de-ice in winter applications, automatic heavy mud control, and user interface that allows the user to select equipment type and leave. Designed a completely above-ground rinse system to remove salt deposits from U.S. Special Forces helicopters. Integrated ultra-high-pressure water blasting equipment with noise suppressing booths and air handling for moisture and breathing air. Designed a system to automatically wash car tires and wheels prior to storage for a company performing winter/summer tire swaps. Created an ultra-high-pressure automated wash conveyor to strip paint and labels off of LP tanks. As an innovator in the field, Riveer has pre-treatment experience and performance assurance that no other company can match. Phosphatizing, both zinc and iron phosphate, requires compliant recovery and recycling.